After cycling through Hungary, Slovakia and Austria we crossed a tiny border crossing between Austria and Czech Republic. And at the same time we did that we felt that we were stepping back in time. It was the largest perceptible difference between two countries we had seen within Europe. We cycled through fields with here and there tiny villages and towns such as Slavonice, Kunzak and Poplin. Nice forest surrounded us as we cycled and we found bunkers as remnants from the first and second world wars. We were very happy to find blueberries in the forest. Although we were not immediately sure, after we saw people picking them we knew we could eat them. After seeing a few cherry trees we were on the lookout for more trees. It seemed the cherry season was already over. Most cherry trees were empty or already passed their picking time. But we were in for a surprise. We came upon a street with many cherry trees and just the most delicious cherries! They were ripe and there were so many. It is the best bicycle touring snack ever. And then later the same day we passed through a street with even more cherry trees. These were even more delicious as well. This time Martin couldn’t control himself. He just needed to climb up in the tree to find as many cherries as he could eat. We could even bring some with us for later and we enjoyed them as dessert for dinner. Camping was easy and the weather was great. The forests did their best to provide us with shade and the sunsets were amazing. We shopped in the local Potraviny and every time we found a baker we would take time for a quick break. It was really enjoyable being out and about. We enjoyed hanging out on the square of Prague in the evening. We watched the clock become active on the hour and did some sightseeing the next morning on both sides of the river. Then it was time to pack up and get back on the bikes. We did make a mistake by taking a walking route out of the city which took us up a hill via some steep steps. 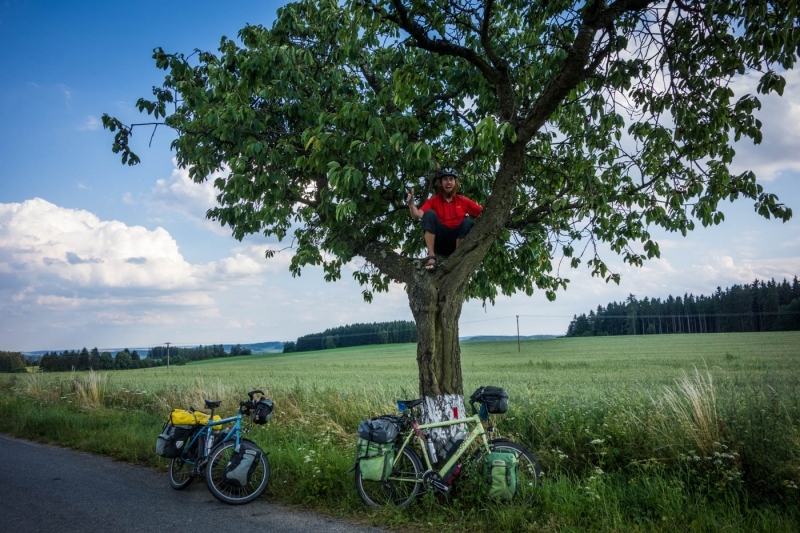 After an intensive push we made it and started cycling out of Prague towards Germany. Martin was keen to try out his bivvy bag which he had only used a few times on the trip. It seemed like a good idea and he set it up nicely only for it to start raining through the night so he woke up a bit more moist than he had desired to be 🙂 Susanne was nice and dry inside the tent with a lot of space. On our way out of the country we passed another bicycle with a motor. We had seen a few of these in Bulgaria as well and now again a few in Czech Republic so we just had to take a photo of it 🙂 While we were cycling out of the country we could see two remarkable hills. These are part of the Lusatian hills in the north of Czech Republic. They were prominent landmarks to cycle past and gave us a nice goodbye to the Czech Republic. Our time through Europe has been really important to us. It is not that we were having the most incredible adventures with the highest mountains and the most eclectic surroundings with a huge culture shock. Important for us is that it was about living the outdoor life. About having small encounters with people, reflecting on our journey about the experiences we have had and the people we met. It was about the places we have seen and the roads we travelled all together with rediscovering Europe. While we were rediscovering things as simple as drinking water from a tap and using normal toilets on a daily basis. It has been great to see that in many places in Europe there is still a lot of nature. The nature being it old or new there is still quite a bit of wildlife around. We would see small deer on a daily basis, hares, a fox here and there and many nice birds. These are the small things that make a bicycle tour really special.